Who needs an idea for a Valentines day inspired breakfast?!?! This one is going to make your families really love you! With the fresh strawberries and the gourmet flavor you can't loose. I love stuffed french toast! Every time we go to IHop that is probably what you will see me get. So a few years ago when this recipe showed up in my Gooseberry Patch Calendar I knew it was going to be a real winner! In a bowl, mix together the ricotta cheese, powdered sugar and vanilla. Spread a little of the mixture over 8 slices of bread and top with remaining bread (like a little french bread sandwich). Beat eggs and milk together in a dish big enough for the bread to lay in. Soak the sandwiches in the egg mixture for 30 seconds to a minute on each side and then cook on a hot, greased griddle or pan for a few minutes on each side or until golden brown. ***In a big bowl mix together the whipping cream and granulated sugar on high with a hand mixer until soft peaks form. 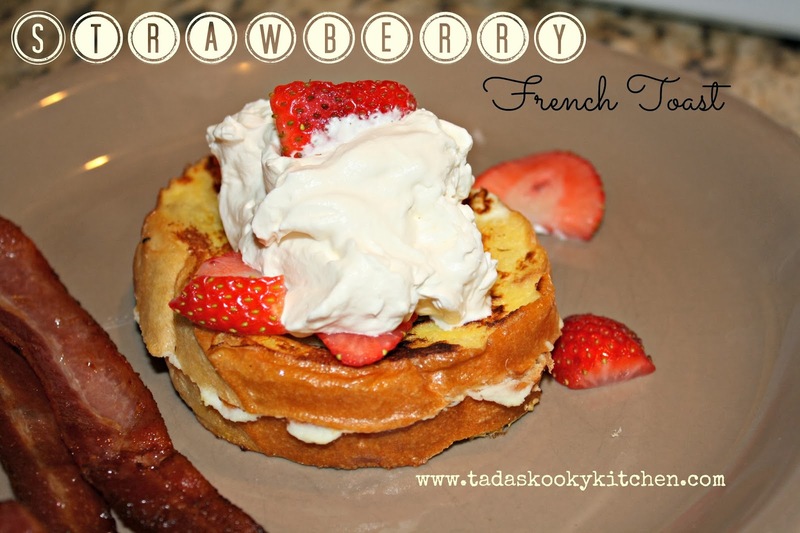 When french toast is done top with whipped cream and sliced strawberries!! Happy Valentines Breakfast everyone! !